We’ve been behind ‘Hate Crime’ since we first received a mysterious copy through the post and now it seems the terrifying events have been leaked online. You only have one month to view the film sent by an anonymous source but believe us this film is brutal. James Cullen Bressack says this film is his and be warned he may crossed the line between truth and fiction in a way you will be scarred for life. To see why we urge you to see ‘Hate Crime’, read our REVIEW. 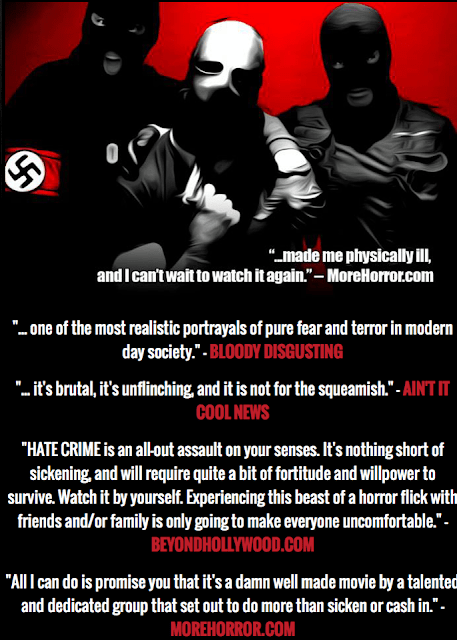 ‘Hate Crime’ is now available worldwide on VOD exclusively on http://www.psykikjunkypictures.com . And when we say worldwide we mean WORLDWIDE! That’s right absolutely everyone can watch the film now! Many have been patiently waiting to see the film Hate Crime for months now. Well the wait is officially! IT IS AVAILBLE NOW ON VOD WORLD WIDE at this link: http://psykikjunkypictures.com/ for $6.66 but you better hurry because it will only be available for 1 month before it gets taken down off of VOD for its DVD/BLU release in AUGUST through Unearthed! That’s if the FBI don’t find this film first. This is the second feature film by 21 year old James Cullen Bressack, his first being the amazon horror best seller ‘My Pure Joy’ which was released last year. Despite its name, ‘Hate Crime’ is a labor of love from a dedicated group of people looking to make something different. Hate Crime is a violent, realistic portrayal of one of our worst nightmares, being attacked in our home. The movie has been extremely well received by over 80+ reviewers, including some of the biggest reviewers in the horror film community and ourselves. It has already won best picture (including the one awarded in our 2012 BloodGuts awards for ‘Best Indie Film’) and best director at multiple film festivals around the world and made many horror sites top 10 lists of 2012. This film has fought alot of controversy due to it’s extreme content, almost being banned in the UK, being pulled off the screens at festivals before even showing due to content and theatre management not willing to show the movie the festival booked, and had faced some trouble finding distribution since the shooting in CT due to its content.